Within decades of the American Revolution, the Northern states had either ended slavery or provided for its gradual abolition. Slavery, however, was entrenched in the South and remained integral to American politics and culture. Nationally, it was protected by the U.S. Constitution, federal laws, and Supreme Court decisions, and slaveowners dominated all three branches of the federal government. From the time of the Revolution until the Civil War (and beyond), Southern thinkers offered a variety of proslavery arguments. This body of thought--based on religion, politics and law, economics, history, philosophy, expediency, and science--offers invaluable insights into how slavery shaped American history and continues to affect American society. 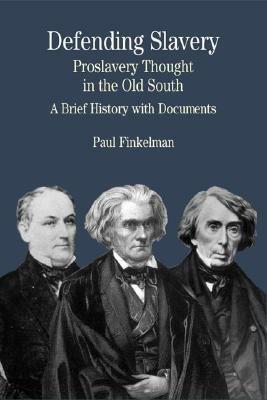 In this volume, Paul Finkelman presents a representative selection of proslavery thought and includes an introduction that explores the history of slavery and the debate over it. His headnotes supply a rich context for each reading. The volume also includes a chronology, a selected bibliography, and illustrations. "This collection will make an excellent addition to the Bedford series.... The documents are well selected. Readers will get a good sampling of many 'classic' statements of the proslavery ideology. Moreover, a wide variety of arguments are represented.... The introduction is especially note worthy; I am unaware of any concise introduction to proslavery thought that is better suited to the classroom." Paul Finkelman is the President William McKinley Distinguished Professor of Law and Public Policy and Senior Fellow in the Government Law Center at Albany Law School. His many books include Slavery in the Courtroom (1985), which received the Joseph L. Andrews Award from the American Association of Law Libraries; His Soul Goes Marching On; Responses to John Brown and the Harpers Ferry Raid (1995), which was a History Book Club selection; and Slavery and the Founders: Race and Liberty in the Age of Jefferson (second edition, 2002); and he is the co-author of A March of Liberty: A Constitutional History of the United States (2002). He edited Dred Scott v. Sandford: A Brief History with Documents (Bedford/St. Martin's, 1997), another volume in the Bedford Series in History and Culture. Finkelman has also published numerous scholarly articles on American legal history and race relations, and he lectures frequently on these subjects. In 1995, he was designated Virginia Historian of the Year by the Virginia Social Science Association.